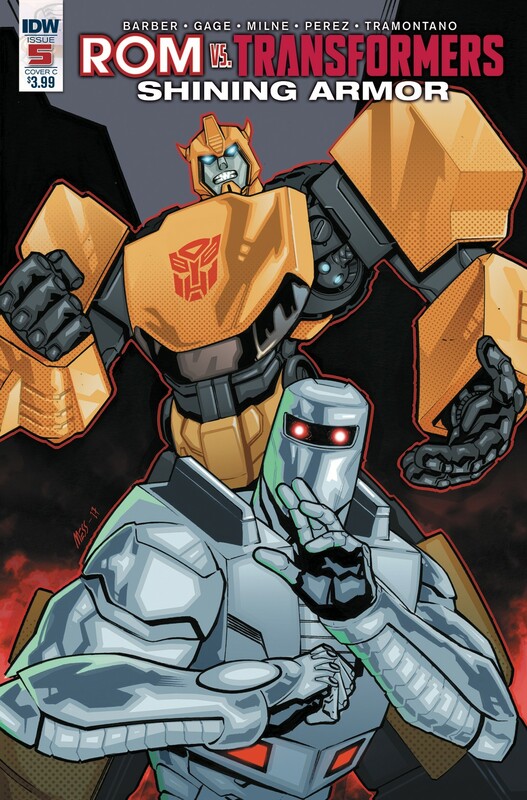 Courtesy of Previews World, we have variant covers for the upcoming final issue in the Transformers vs Rom: Shining Armor miniseries set 200 years before current events, and featuring the first interaction between Cybertronians, the Solstar Order, and Dire Wraiths. Check out the art below and in our database entry, by Nick Roche and Josh Burcham first, by David Messina second, and join the conversation in the Energon Pub! 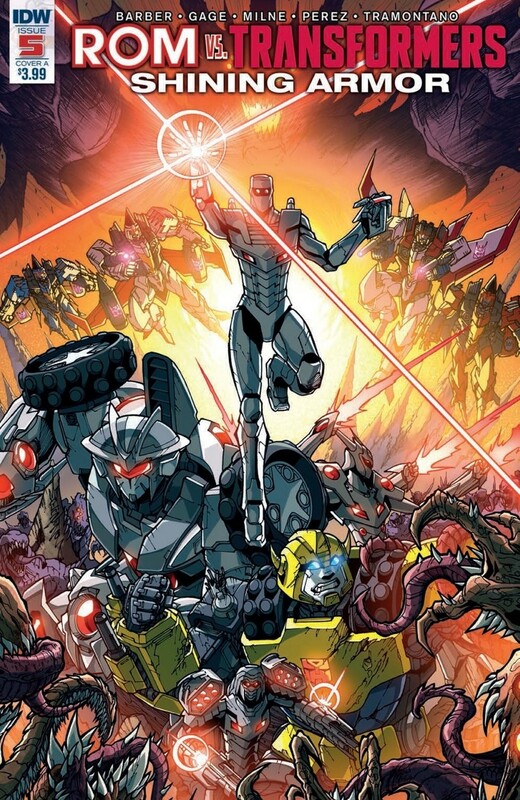 Bumblebee vs. Rom vs. Starscream vs. the Dire Wraiths! All alliances are off-this is a fight for survival! Torn between her Cybertronian heritage and her Solstar Knight upbringing, Stardrive takes control of her fate! Ooft, I don't like that second cover much. Doesn't fit Bumblebee at all. In another bout of iTunes preview magic, we have an initial look at the final issue of the mini-series crossing over two of the current IDW Hasbro licensed franchises - set 200 years before anything we're currently seeing in-universe - Rom vs Transformers: Shining Armor #5! 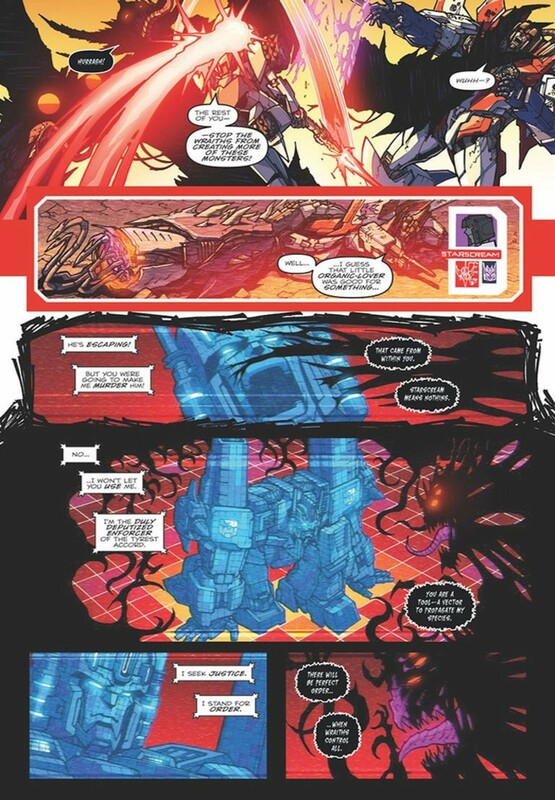 We start straight off with the Ultra Magnus/Dire Wraith hybrid, so be ready for some eldritch and (robo)body horror from artist Alex Milne - plus obvious spoilers if you're not caught up yet - and some Starscream schadenfreude for those of you into that sort of thing. Check the preview out below, and join the conversation as we wait the couple of weeks left until the book's release. Starscream and tentacles. OH BOY! I'm still interested to see how they are going to handle Magnus and whoever is Magnus at this time. I'm excited to see how Magnus and Vekktral fight it out in mindspace, and I'm curious as to how the wraith takeover will affect the recall switch. I find anything involving good starscream writing is a fair story. TAAO and this has been wonderful. Decided to pick this up on Comixology and admit, I've really enjoyed it. 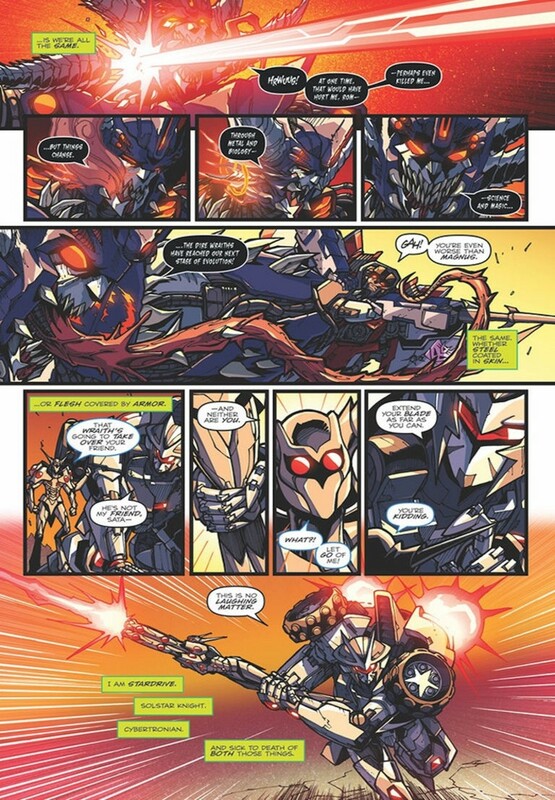 Great art, solid story and Starscream being awesome. Quite like this version of Magnus too. So just a quick PSA for anyone reading this series. If you enjoy this series, you might wanna pick up Optimus Prime #13. Big Grim wrote: Decided to pick this up on Comixology and admit, I've really enjoyed it. 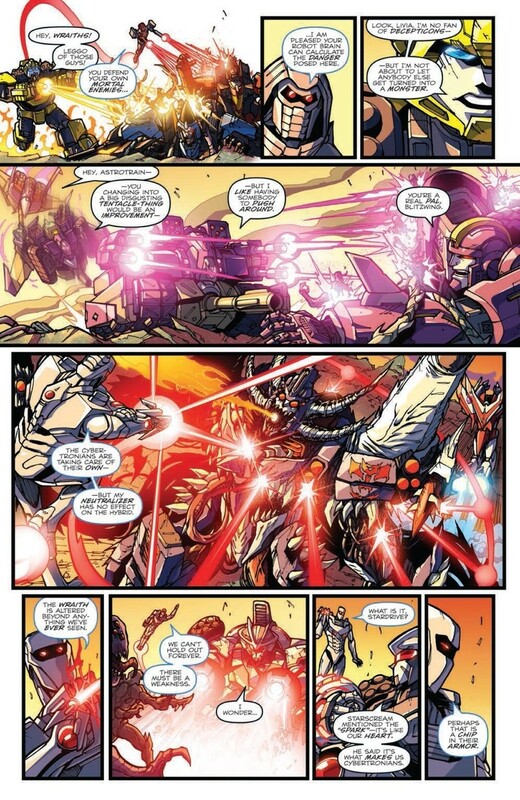 Great art, solid story and Starscream being awesome. Quite like this version of Magnus too. I'm honestly shocked more people won't read this. It is a great story, and a great crossover! 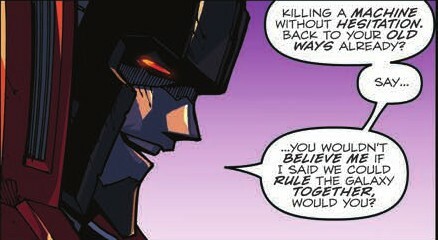 It's fun seeing Starscream being a smarmy, evil **** again! As evil as he is, I like to see them attempt at seeing how he would fare as a leader. Since most series bait him with it but never go through with it. This is delightful though - its just so him. I hopefully can pick up all my books from the pull file next week. Sunstar wrote: I like to see them attempt at seeing how he would fare as a leader. Oh agreed! I'm loving him as ruler of Cybertron. This is just a nice kick back to his villainy. Just a side note: is there no quote buttons to quote someone? @Big Grim: Yep, he's got some lovely characterisation, and sarcasm that goes with his villainy. I love how he manipulates a situation. I love how he gets himself out of a pickle too. Sunstar wrote: Just a side note: is there no quote buttons to quote someone? There is, but some of the icons have disappeared in their image form. This is being worked on! Motto: ""Whatever it takes, as long as it is moral, legal, and just."" A couple of Seibertron.com community members have linked to us to the full previews of this week's comics by IDW Publishing featuring our very own Cybertronian favourites, in two separate series, both on entertainment site Newsarama - second and last to the list is the final issue of the prequel to some of the recent events, and probably more still to come, in the Rom Vs Transformers: Shining Armor mini-series. Issue #5 tries to bring us to some sort of closure on the plot threads so far, but it mostly looks like the Dire Wraiths have the upper hand as we head back to Vekktral!Magnus, Stardrive, Bumblebee, and Starscream's failed machinations. Check it out below, and check out our review of the issue later this week! 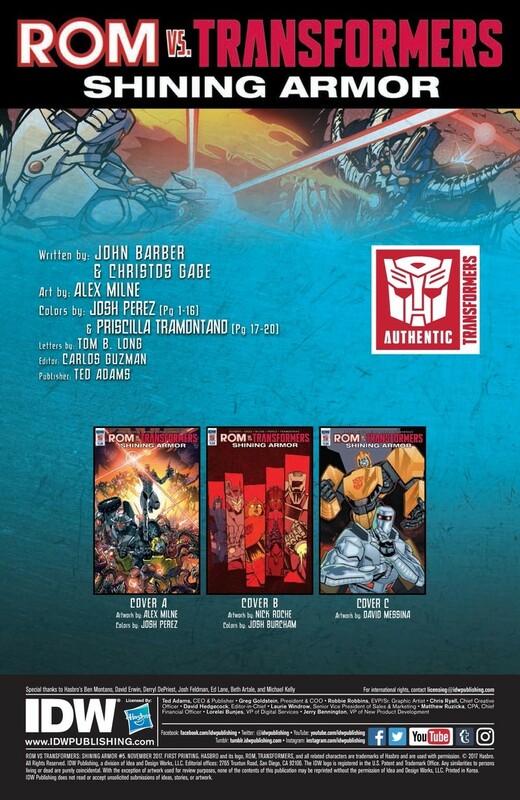 - An all-star lineup of Christos Gage (Rom), John Barber (Optimus Prime), and Alex Milne (More Than Meets the Eye) tell the never-before-revealed secret history of Rom and the Transformers! We reach, with issue five, the last part of this mini-series uniting both Transformers and the Solstar Order of Rom and the other Knights. And I'll admit, I'm both glad the conclusion was as satisfying as it was, and a little saddened that the story is entirely over as far as we're concerned in the current IDWverse. Though it's true, repercussions retroactively are felt through Revolution and First Strike, and we have some continuations elsewhere too, Stardrive's story is currently done with. I had my concerns earlier in the series - issue two specifically, as you can read again here - but since then, both John Barber and Christos Gage have been able to diverge from the potentially platitude-filled plot, into a cosmic cluster-truck of a comic, and a truly enjoyable mini-series that attempts to introduce new characters to old stories, and new stories with established characters. The best part of the combination of the two styles, for me at least, was the amount of fun that they clearly had in filling in the stories. 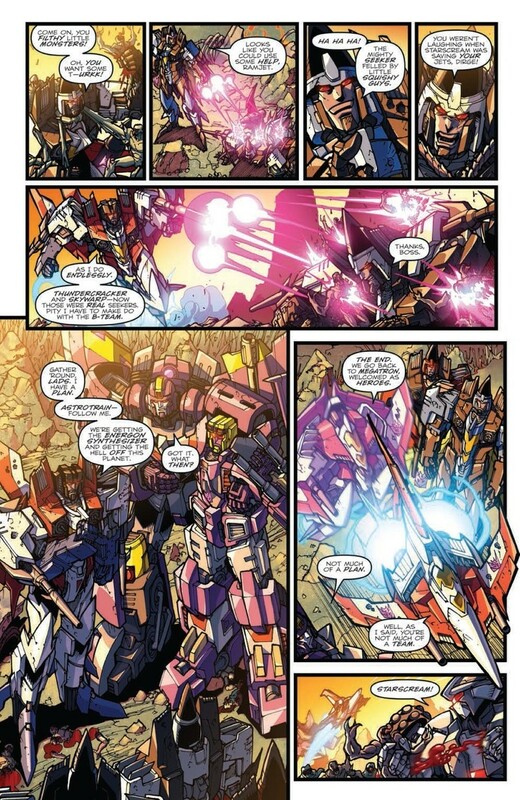 The interactions between the Decepticon team, Starscream included, are some of the best examples of robot-banter that come to mind in recent books, and play entirely into good fanservice and references. And best of all, they don't cause tonal whiplash that can be common in this type of story, as we switch to other scenes in the book. If there is one major critique I have about the issue, and perhaps the series as a whole, it's its supposedly titular character: Stardrive does have a lot of moments, and she does appear a lot more after the initial qualms I had earlier in the series, but there is still a lingering sense of not having had enough about her, with a not entirely satisfying resolution by the end of it all. Which is a shame, given the potential of her story, and I do want to see more of it. Alex Milne really gives in - as we started seeing in the past numbers - to his technorganic leniencies, as Vekktral!Magnus is pretty much centre-stage for the entire issue, and the reason around the rest of the cast to rally and find their own resolution to their respective plots, with some really exciting choices in the Magnus side of the story, and some fantastic action sequences all the way through. The colouring, perhaps, is what is the newest addition to the visual style, and what sets the recognisable Milne hand from other Transformers titles so far - in the best way possible, of course! Josh Perez has been amazing for the entire series, and the gradual sunset in this issue just proves it - plus the addition of Priscilla Tramontano's work to cap it all off towards the end, and I am one visually satisfied reader. Tom B. Long on the side of production and lettering has some truly excellent moments too, balancing the work of the artists in such a way that the fonts chosen and the words placed do never cover what the focus should be, and instead draw attention to them. 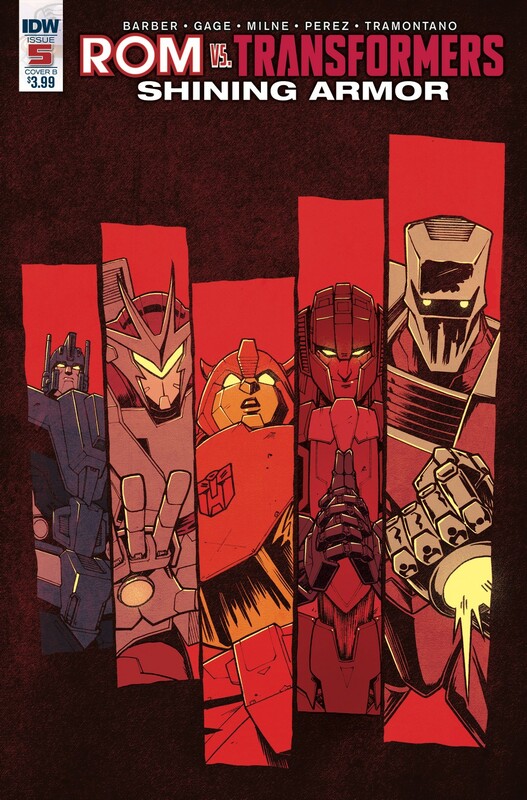 In terms of covers, the one in the thumbnail is the splendid Nick Roche / Josh Burcham action portrait, while the other two (previously seen in news stories) can be found as always in the Database entry for the issue here. The new approach, for this side of IDW comics at least, of going plot-first was an interesting one - especially given the position that this series would occupy as a generic prequel to a lot of current galactic politics in the Hasbroverse - but it turned out to be an excellent one too. Milne's detail-oriented artwork provided a playground in which Barber and Gage could easily work their stories once the framework was established, without burdening the art with too much exposition. And as a result, with the effort of the entire visual team, we get a comic that is extremely enjoyable as a piece of art (read: it's pretty to look at), and successful in doing what it had to do: establish the links in the universe that had to be established after the universe had already been set years ago. Barber's contribution was perhaps the most valued in keeping the threads tidy, but Gage had no small feat either, and they synchronised very well. There are some flaws, such as the second issue's slump, and the trade will undoubtedly prove a much smoother reading overall - and what is perhaps the best outcome of the series is that both target readerships probably got enough page-time each to satisfy being 'lumped together' feelings that inevitable rose at the start. We do find out a lot more about the Order, and the Dire Wraiths are better established as antagonists throughout, and even through the humour - at times almost surreal - there are some really touching moments. Do yourself a favour, and give this series a read! I'll say it again: best crossover in the Hasbro verse. 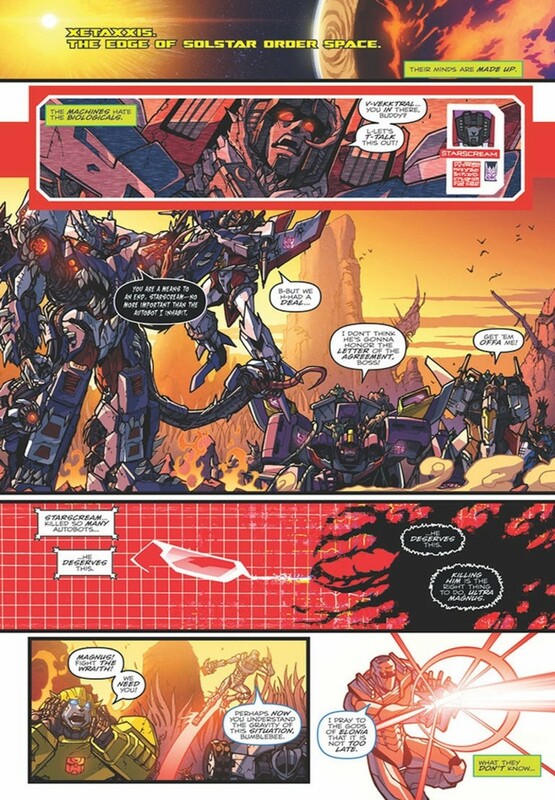 Though with Stardrive now appearing in Optimus Prime, I wonder where they will go with that very last panel? I really liked the Magnus part too, the fighting the infection and then taking control was great to see. And at least we got that patch with Minimus' role and longevity in there. 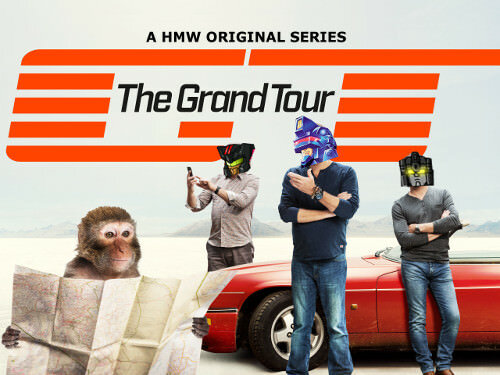 D-Maximus_Prime wrote: I'll say it again: best crossover in the Hasbro verse. Yeah you can tell that it wasn’t the plan to shoe horn the ending with Minumus but is anyone is gonna fix something it’s John barber. Certainly an better patch job than what Lost alight #11 with Thunderclash and Getaway. People were pointing out the error on twitter and Roberts said he’lll have to do some rewriting in the dialogue for the trade. Yeah I was thinking the same. It does seem a bit out of character for Minimus to step out of the armor and come back by request. He was shot as they said and I guess that was him saying I’m out however in MTMTE he says the mantle of magnus is the only thing that he felt gave him a purpose and it was everything to him. While it’s a bit pushed maybe it should have been “the previous magnus was shot and has been in a coma for the past century but ratchet thinks he can finally come out of it and return as Magnus” or that convoy was just a temporary Magnus while Minimus has been recovering. The ratchet part doesn’t bother me. I’ve kind of taken it as-like ratchet said in #21- he’s always known about the Armor. Ratchet may be the one who helps Tyrest choose who can handle the Magnus Armor and work from behind the curtain. He doesn’t have to be there for the fitting in person but he’s there in some way. Fun, visually gorgeous series that just doesn't stick for me. Liked it, didn't love it. Would have liked to see more world-building, I think? 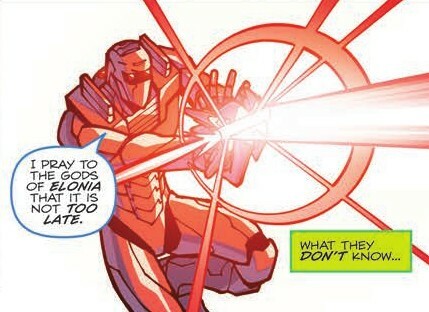 Maybe it's that the Solstar Order seems to say the same thing in different ways in every book they appear in and being one of the 18 people that read the entire recent Rom run has me wanting more out of them. I think the only thing that would have made this better would have been if instead of Ramjet, Dirge and Thrust we’d gotten Slugslinger, Misfire and Triggerhappy instead. 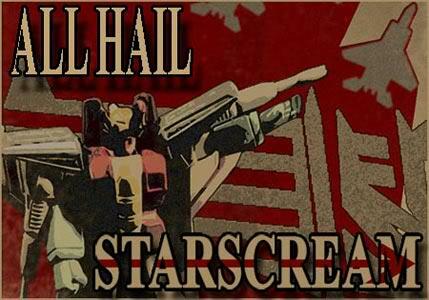 Starscream continues to insult them throughout the series as a crap team. Woulda been fun to see those three pop up as a team of seekers before they all went their separate ways. ScottyP wrote: Fun, visually gorgeous series that just doesn't stick for me. Liked it, didn't love it. Would have liked to see more world-building, I think? Maybe it's that the Solstar Order seems to say the same thing in different ways in every book they appear in and being one of the 18 people that read the entire recent Rom run has me wanting more out of them. This is what I meant a long while ago, when I lamented the lack of Gage's noticeable input in the story. Admittedly, I do agree with you in part, but I felt like the closing scenes probably gives us a lot more than the rest of the series on the Order - and the focus really was the Dire Wraiths after all. This is something I can agree on. While I've never really enjoyed any Transformers cross over with another brand, I can say that I actually did enjoy this and actually looked forward to each issue. While I still loathe the whole Hasbro-IDWverse, this one kept itself self contained enough that I could consider it just another Transformers story.